Hey dolls! Can you tell that I’m extremely behind in posting collection reviews? I know you all have been seeing the fall KBShimmer collection, which I’ll review soon, but first, I have photos for you of the second part of the KBShimmer Summer 2014 collection (see part 1 here). This half of the collection features jelly and crelly (creme-jelly hybrid) based glitters and one holo. 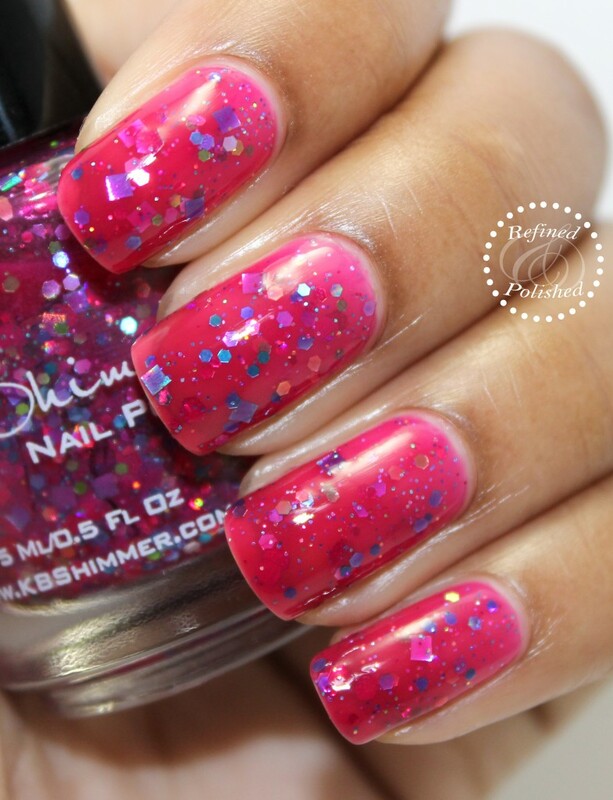 KBShimmer Looking High and Holo is described as a raspberry colored jelly with holo hexes and a scattering of holo squares. I really like the color of the base jelly. The formula applied easily and built up nicely in three coats. I would recommend waiting a few minutes in between coats to avoid dragging. Top coat was used to smooth out the glitter. KBShimmer Mint-al Vacation is described as a dusty seafoam mint. 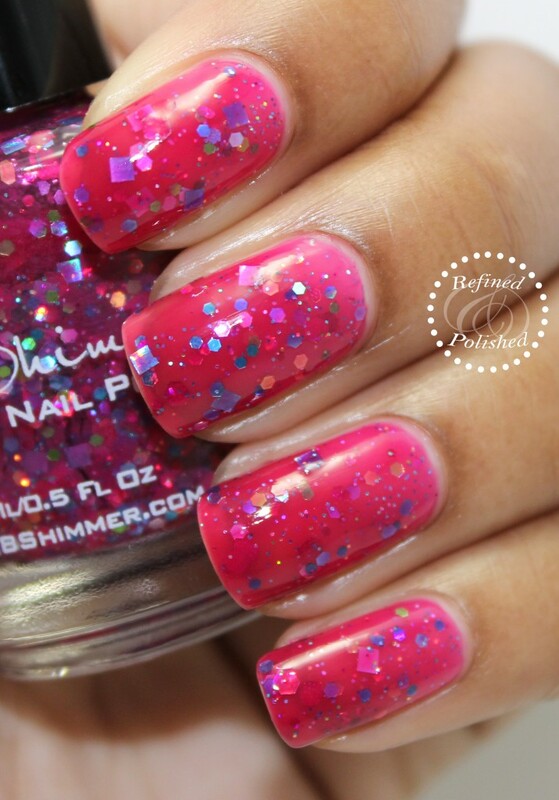 This is definitely my type of holo! 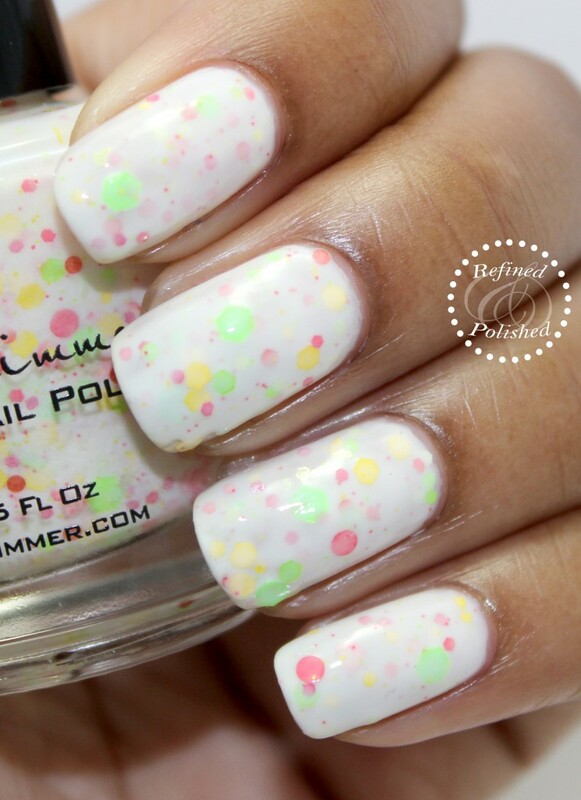 Indoors Mint-al Vacation has a strong white shimmer and in the sun it has a subtle holo effect. You’ll see a little bit of both aspects in my lightbox photos below. The formula was good and applied easily. I did have a little patchiness on a few nails at two coats, so three were used for opacity. 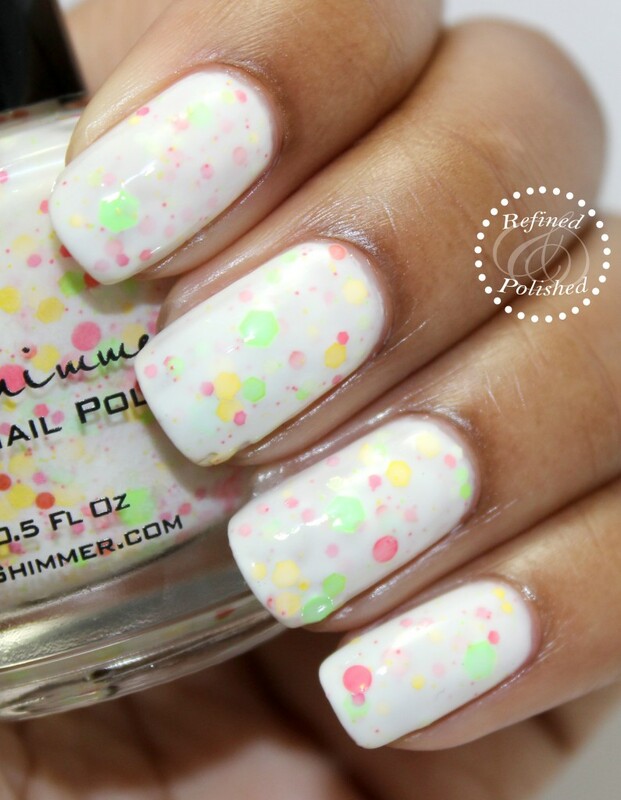 KBShimmer Mixed Peelings is described as a creamy off white base with glitters in neon green, lemon yellow, and watermelon pink. Just when you think we’ve seen every white based glitter combination, something refreshing like Mixed Peelings comes about. The glitter was sparse on the first two coats and I had to move and dab the larger pieces onto the nail. The third coat helped to even out the polish. I recommend waiting a few minutes in between coats to prevent dragging and using top coat to smooth out the glitter. 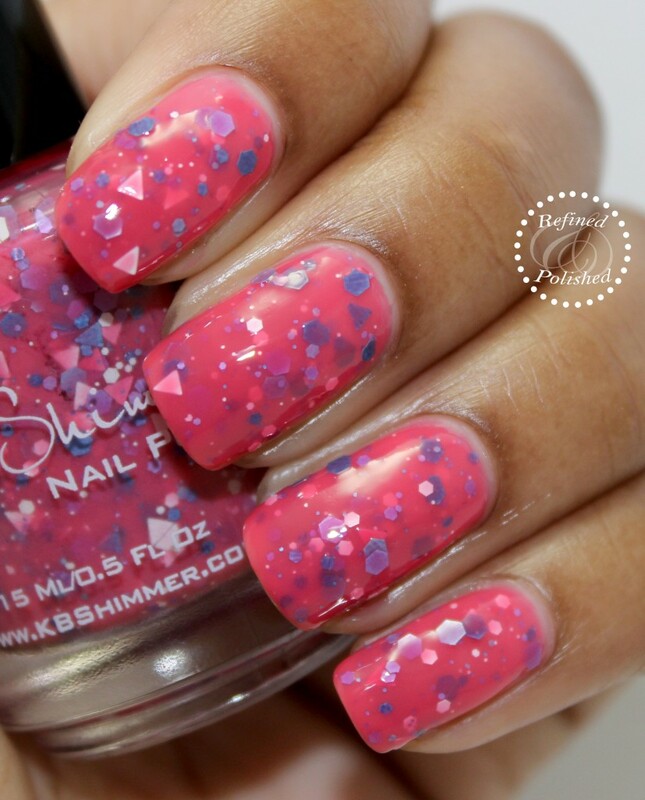 KBShimmer Peak My Interest is described as a pink polish with a coral undertone that features triangle glitters in white, pink, and dark aqua, and hex glitters in periwinkle, white, and dark aqua. Surprisingly, I didn’t mind the triangle glitters in this polish because of how small they were. Peak My Interest’s jelly formula was good and applied easily in three coats. As with the others, I recommend waiting in between coats and using top coat to provide a smooth finish. 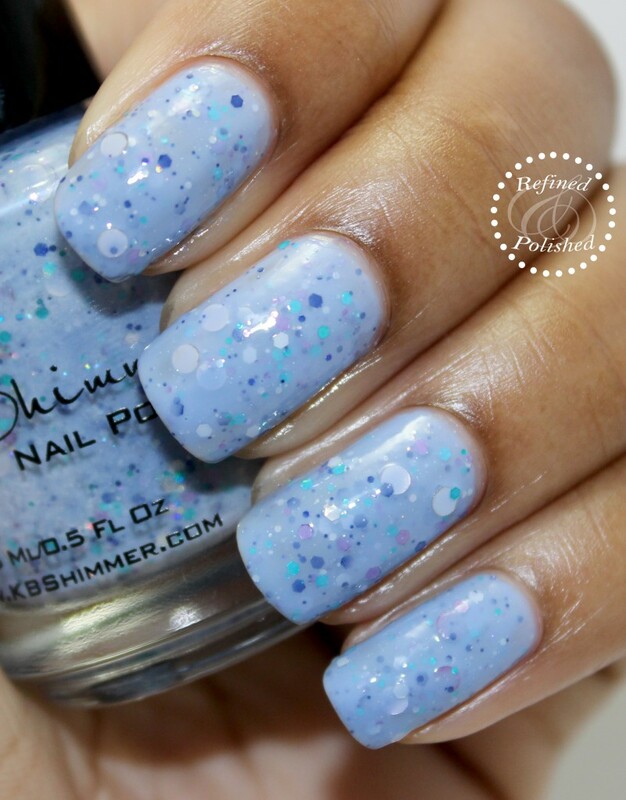 KBShimmer Periwinkle In Time is described as a soft cool blue with a purple undertone, accented by silver holo and violet holo circle glitters and holo glitters in teal, violet, marine blue and silver, and a micro holo shimmer. This is one of my favorites from this half of the collection because of the softness of the base shade. 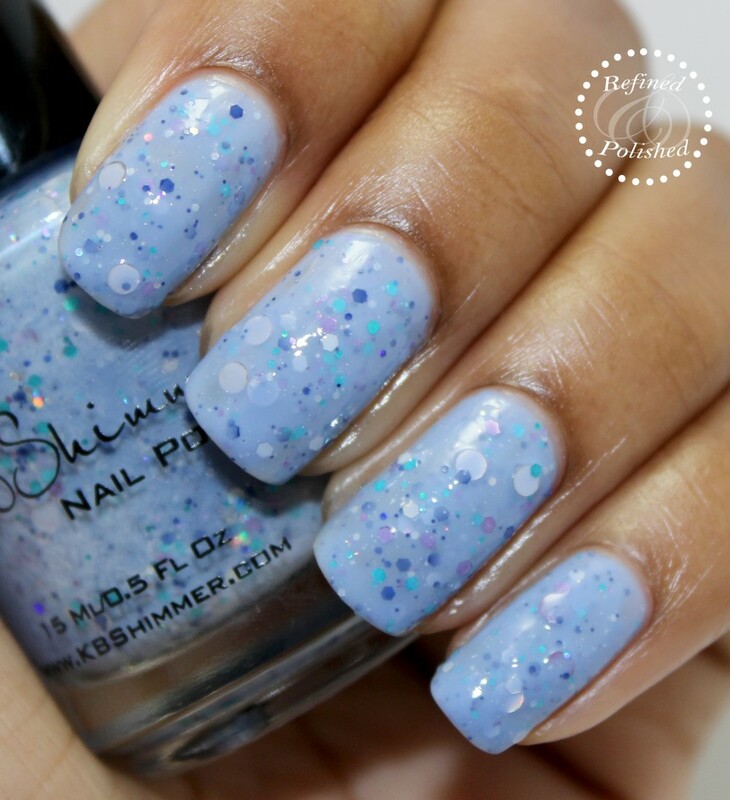 Periwinkle In Time’s crelly formula was good and applied evenly in two coats. Top coat was used to smooth out the glitter. KBShimmer Sea You Around is described as an emerald green jelly with teal undertones that is filled with fuchsia, light blue, and chrome circles, sky blue squares, hexes in silver, blue, and fuchsia, with a dusting of fuchsia microbars. 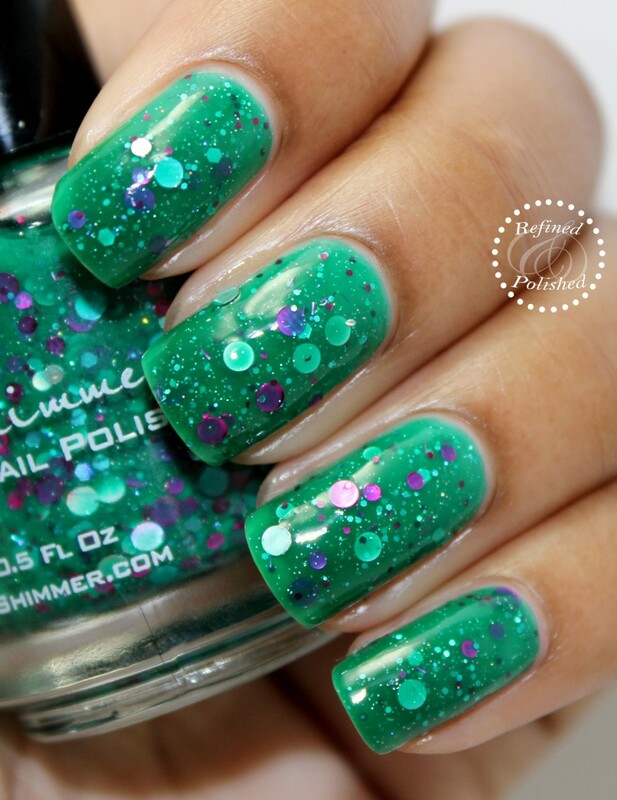 This polish actually looks like the glitters are floating in the jelly base and is very reminiscent of the ocean. 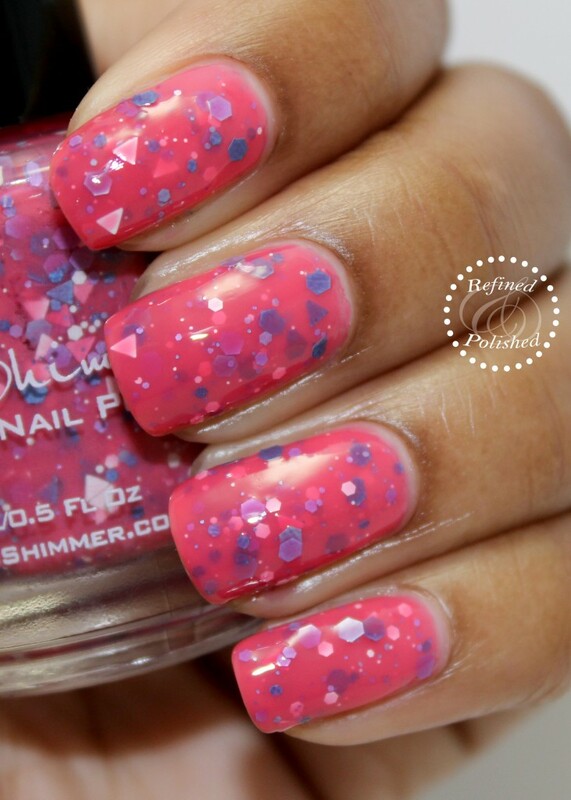 Sea You Around’s formula was great and built up to opacity in three coats. Top coat was used to smooth out the finish. Glitter lovers will greatly appreciate this collection! 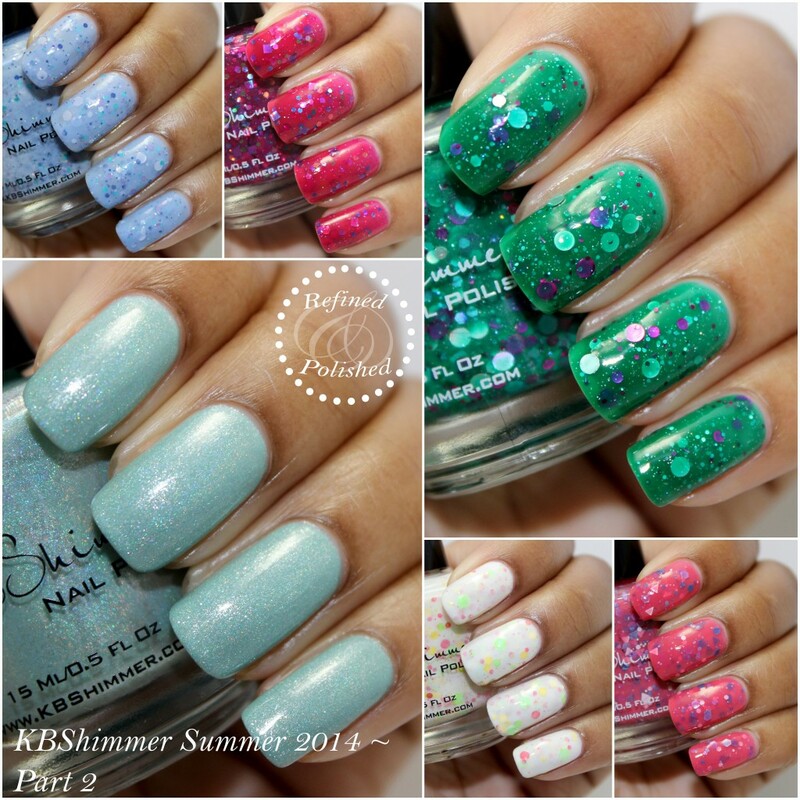 The KBShimmer Summer 2014 set is currently available for $8.75 each here. Be sure to keep up with KBShimmer on Facebook. Instagram, and Twitter for updates and new releases!